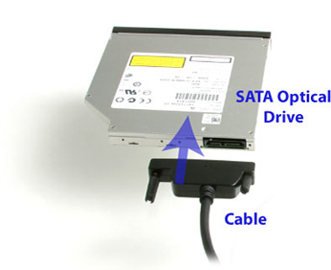 The easiest and simplest way to attach a SATA optical drive externally to laptops equipped with an eSATAp port (also known as an eSATA-USB Combo port). Plus! get blazing transfer rate speeds! This is the perfect solution for those that are using the notebook's optical drive bay to add a 2nd hard drive. You can then use the cable to easily attach the optical drive. Several manufacturers now have notebooks that have a new kind of port that is a combination of eSATA and USB. 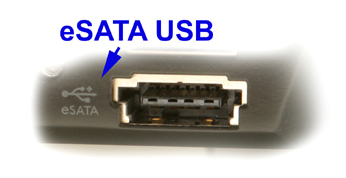 This special port can be identified with the "USB" and "eSATA" icons marked alongside the port as seen in the photo below. These special ports combine the convenience of USB power and the blazing speed of eSATA. This cable will enable you to attach your SATA optical drive externally. With our kit, you will be able to access a SATA optical drive externally with SATA blazing speed transfer rates. You can even "boot off" the external SATA drive. No external power is needed because it is handled by the eSATAp / eSATA-USB Combo port of the laptop. Works with SATA Optical drives.